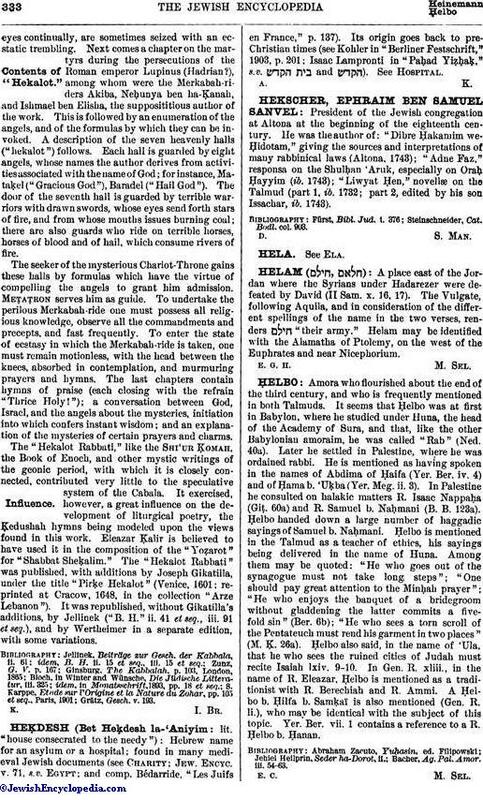 Two mystic writings attributed to Ishmael ben Elisha; indiscriminately referred to by the various names of "Sefer Hekalot," "Pirḳe Hekalot," "Pirḳe Rabbi Yishmael," "Pirḳe Merkabah," "Ma'aseh Merkabah," "Hilkot Merkabah." They are also quoted as the "Book of Enoch," and contain material found in that old apocryphon. They are based upon the remnants of the apocalyptic books of the mystic Essenes (see Apocalyptic Literature; Eschatology; Essenes) found in Mishnah (Ḥag. ii. 1) and Talmud. 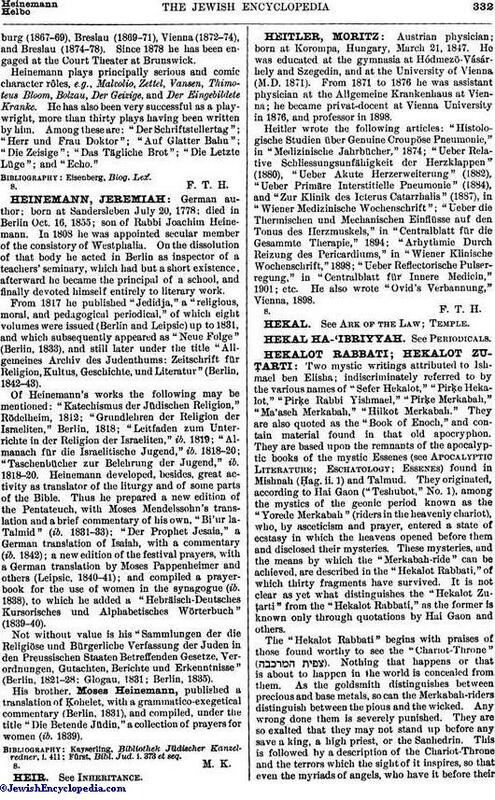 They originated, according to Hai Gaon ("Teshubot," No. 1), among the mystics of the geonic period known as the "Yorede Merkabah" (riders in the heavenly chariot), who, by asceticism and prayer, entered a state of ecstasy in which the heavens opened before them and disclosed their mysteries. These mysteries, and the means by which the "Merkabah-ride" can be achieved, are described in the "Hekalot Rabbati," of which thirty fragments have survived. It is not clear as yet what distinguishes the "Hekalot Zuṭarti" from the "Hekalot Rabbati," as the former is known only through quotations by Hai Gaon and others. The "Hekalot Rabbati" begins with praises of those found worthy to see the "Chariot-Throne" ( ). Nothing that happens or that is about to happen in the world is concealed from them. As the goldsmith distinguishes between precious and base metals, so can the Merkabah-riders distinguish between the pious and the wicked. Any wrong done them is severely punished. They are so exalted that they may not stand up before any save a king, a high priest, or the Sanhedrin. This is followed by a description of the Chariot-Throne and the terrors which the sight of it inspires, so that even the myriads of angels, who have it before theireyes continually, are sometimes seized with an ecstatic trembling. Next comes a chapter on the martyrs during the persecutions of the Roman emperor Lupinus (Hadrian? ), among whom were the Merkabah-riders Akiba, Neḥunya ben ha-Ḳanah, and Ishmael ben Elisha, the supposititious author of the work. This is followed by an enumeration of the angels, and of the formulas by which they can be invoked. A description of the seven heavenly halls ("hekalot") follows. Each hall is guarded by eight angels, whose names the author derives from activities associated with the name of God; for instance, Mataḳel("Gracious God"), Baradel ("Hail God"). The door of the seventh hall is guarded by terrible warriors with drawn swords, whose eyes send forth stars of fire, and from whose mouths issues burning coal; there are also guards who ride on terrible horses, horses of blood and of hail, which consume rivers of fire. The seeker of the mysterious Chariot-Throne gains these halls by formulas which have the virtue of compelling the angels to grant him admission. Meṭaṭron serves him as guide. To undertake the perilous Merkabah-ride one must possess all religious knowledge, observe all the commandments and precepts, and fast frequently. To enter the state of ecstasy in which the Merkabah-ride is taken, one must remain motionless, with the head between the knees, absorbed in contemplation, and murmuring prayers and hymns. The last chapters contain hymns of praise (each closing with the refrain "Thrice Holy! "); a conversation between God, Israel, and the angels about the mysteries, initiation into which confers instant wisdom; and an explanation of the mysteries of certain prayers and charms. The "Hekalot Rabbati," like the Shi'ur Ḳomah, the Book of Enoch, and other mystic writings of the geonic period, with which it is closely connected, contributed very little to the speculative system of the Cabala. It exercised, however, a great influence on the development of liturgical poetry, the Ḳedushah hymns being modeled upon the views found in this work. Eleazar Ḳalir is believed to have used it in the composition of the "Yoẓarot" for "Shabbat Sheḳalim." The "Hekalot Rabbati" was published, with additions by Joseph Gikatilla, under the title "Pirḳe Hekalot" (Venice, 1601; reprinted at Cracow, 1648, in the collection "Arze Lebanon"). It was republished, without Gikatilla's additions, by Jellinek ("B. H." ii. 41 et seq., iii. 91 et seq. ), and by Wertheimer in a separate edition, with some variations.